What is the best way to solder to Nitinol? Nitinol (a nickel titanium alloy) has become a very important material, especially in the medical world. It is often necessary to "attach" Nitinol to another piece of Nitinol or some other material such as platinum or stainless steel. Common high temperature bonding methods, like welding, are not suitable for bonding to Nitinol because high temperatures can ruin Nitinol's shape memory characteristic. However, the temperatures associated with soldering, considerably lower than welding, do not threaten the properties of Nitinol. While soldering may be the desired means of attaching to Nitinol, it does not come without its challenges. Nevertheless, with the right material set and equipment, soldering to Nitinol can a robust process. One of the obstacles to soldering to Nitinol is the inherent titanium-oxide-rich top layer. In order for soldering to take place, the molten solder must have access to clean oxide-free metal. That means that the titanium-oxide-rich layer has to be removed. There are a couple of ways to remove the oxide layer; they can be used in concert with each other and can be repeated as necessary. If the size of the part allows, the oxide layer can be mechanically abraded off. It is also possible to "chemically" remove the oxide layer. That is typically accomplished with a flux. 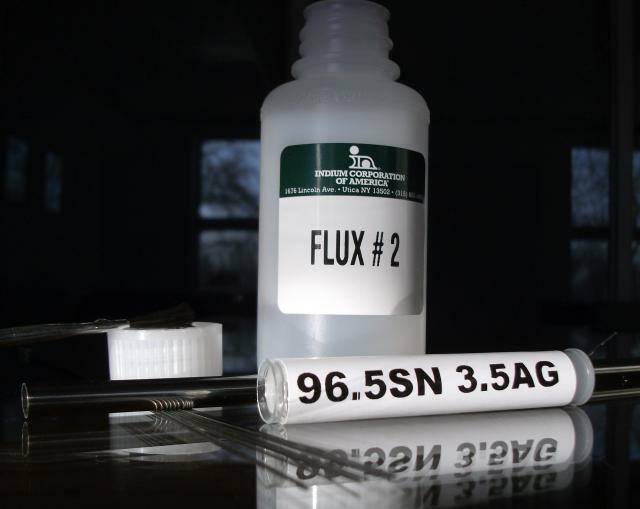 Traditional soldering fluxes are typically designed for relatively pristine surfaces such as cleaned copper. Such a flux would not be effective for soldering to Nitinol. But highly active fluxes, capable of removing the titanium-oxide rich layer, are available. Which alloy is used is often determined by the expected life of the device and whether or not it will see high temperature autoclaving. Many single-use (disposable) devices use SnAg; whereas long -term or multiple use devices (autoclaved) use AuSn.